I have become a master of sourcing American ingredients in foreign countries. I have to admit, it feels like cheating a bit here since I speak the language and anything I can’t find in stores I can probably order from Amazon. Still, occasionally I have to go questing for certain ingredients. I’ve already changed the grocery store we get our deliveries from because the first one didn’t carry panko bread crumbs. I thought they had pumpkin, too, but it turns out they don’t carry it in our area. Luckily I just hopped on the subway and popped into the cutest little Mexican market, Lupe Pinto’s, and picked up a can and made cheesecake. They have all sorts of great Mexican and American ingredients in there, so if you’re a Yankee in Glasgow, be sure you check it out. I was all prepared to go on a long quest for the cornmeal for this recipe. See, I’m a Jif corn muffin mix lover myself, but I knew there was no way I was getting that here, and I didn’t want to wait until our next grocery order came in. Luckily, I only had to walk about a half mile down our street to obtain it. If you’re making this recipe, you can totally save yourself time by using a corn muffin/bread mix, but I’ll tell you how I made mine just in case. 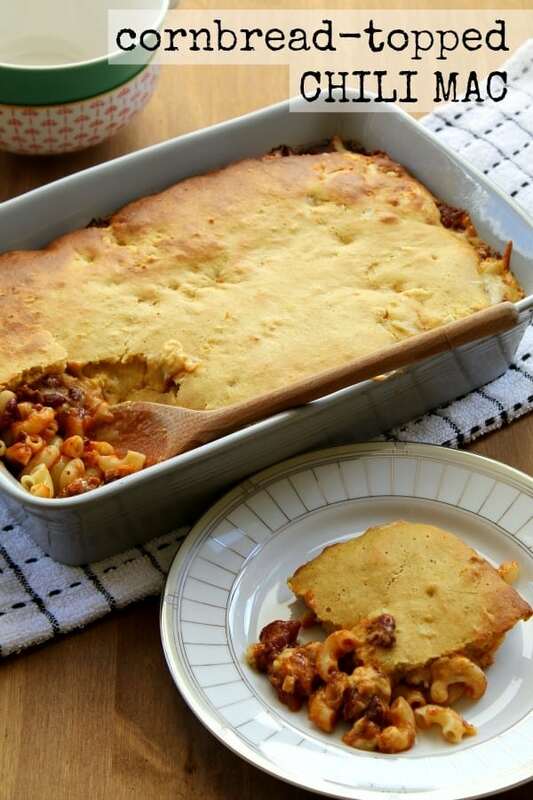 Cornbread-Topped Chili Mac is so comforting and so easy. It’s full of flavors I love, not to mention great textures. The squishy pasta, the stringy cheese, the grittiness from the cornbread… It makes me so happy. I like to take it out of the oven when the top is just starting to turn golden so that the corn batter is still a little under done on the bottom. It gives it sort of a polenta effect which I enjoy. If you want yours 100% cornbready, just cook it about five minutes longer. I love it when things are easy and convenient, but every once in a while, we need a challenge. A quest that makes the prize worthwhile. 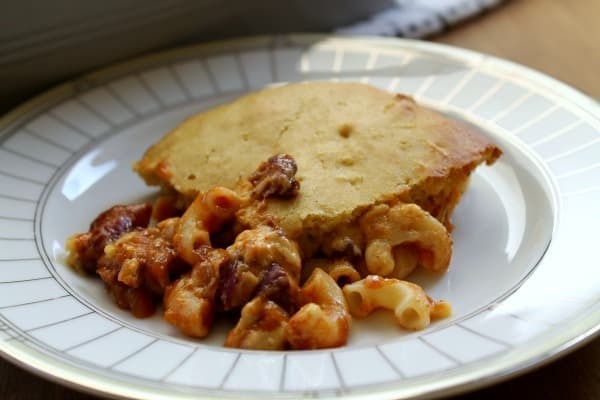 Cornbread-Topped Chili Mac is totally worth it! 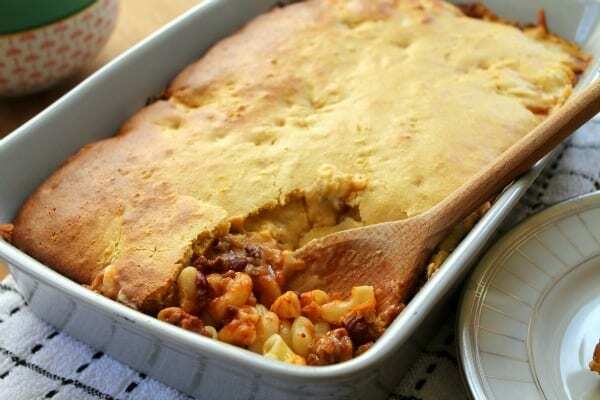 Chili, cheese, and macaroni get topped with a layer of golden cornbread for this ultra-comforting Cornbread-Topped Chili Mac. Preheat your oven to 425 and spray a 2 quart casserole or other baking dish with non-stick spray. Put a pot of water on to boil and cook your macaroni a minute or two shy of the package directions. Drain. While the pasta is cooking, you can prepare your cornbread mix. Combine flour, cornmeal, sugar, baking powder, salt, and vegetable oil in a mixing bowl and stir to combine. Add in the egg and milk, and stir until everything comes together and there are no lumps. Set aside. When your pasta is cooked, add it to the bottom of the casserole dish. Spoon and spread your chili over this to cover it all, then sprinkle on the cheese. Finally, carefully spread the cornbread mixture over the top. It will be pretty sticky, so don't worry if it doesn't go exactly to the edge or you have a few small holes. Bake your chili mac in the oven for 30-35 minutes. Allow to cool for 10 minutes before serving.